I’ve always sort of wondered how all of these brilliant scientists run around spending millions on research to prove the conclusion that mankind is responsible for changes in our climate. Every time I talk to someone about it I point confused at the sun and ask, “What about that?” Well…what about it? I mean, Al Gore is calling people that don’t believe him racists as if science is about towing the line. I can’t help but be reminded about being called a “flat earther” over this crap. This article over at Financial Post makes me want to throw all of these people in jail. Yet this spectacular success will be largely unrecognized by the general public for years — this column will be the first that most readers have heard of it — because CERN remains too afraid of offending its government masters to admit its success. Weeks ago, CERN formerly decided to muzzle Mr. Kirby and other members of his team to avoid “the highly political arena of the climate change debate,” telling them “to present the results clearly but not interpret them” and to downplay the results by “mak[ing] clear that cosmic radiation is only one of many parameters.” The CERN study and press release is written in bureaucratese and the version of Mr. Kirkby’s study that appears in the print edition of Nature censored the most eye-popping graph — only those who know where to look in an online supplement will see the striking potency of cosmic rays in creating the conditions for seeding clouds. So here we are in the middle of a struggling economy and crippling unemployment and we’re letting the EPA shackle us to climate change mythology. This isn’t a small issue. As anyone that has thought about the problem for more than a passing moment realizes, if you take the AGW groups arguments and put them into policy we are committing ourselves to poverty – sacrificing the greatest nation in history on the altar of environmentalist propaganda. We need to get this word out there so we can rally political pressure to dismantle the cap and trade agenda completely and release the people in the oil, coal, and natural gas development communities to continue growing our nation. Chop chop. 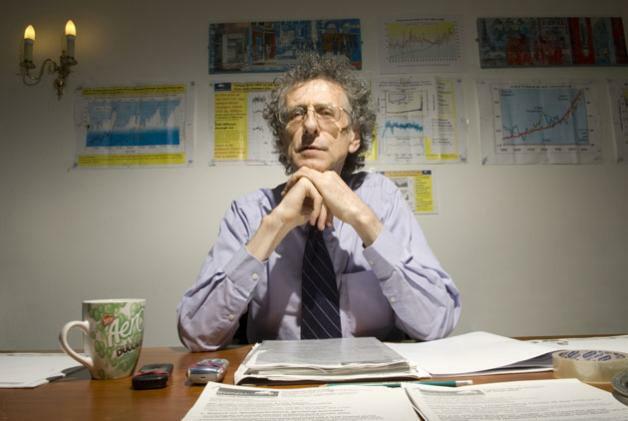 Noted British astrophysicist and meteorologist Piers Corbyn is a thorn in the side of those riding on the gravy train known as Anthropogenic Climate Change (formerly Anthropogenic Global Warming). Mr. Corbyn has been espousing a scientific method linking solar activity modulated by the effects of the moon to predict the weather many months or even years in advance. At the same time he has repudiated the theory that increased CO2 levels in the atmosphere cause rising temperatures and extreme weather. He claims those predicting catastrophic warming are motivated by the government funding available to those who support this theory and a desire to create an economic bubble utilizing a carbon trading scheme. Piers recently (December 1, 2010) issued this forecast. It seems that by using the proven scientific method Corbyn’s prediction of record cold and snowfall has come to fruition as confirmed by the Met Office. That same Met Office’s forecast was predicting a mild winter with temperatures above average. This story, on its face, is not all that remarkable; Corbyn, a skeptic who got lucky predicting some cold weather who has and will be discredited as an extreme right wingnut who denies the proven science. The fact is that Corbyn has an impressive record of well above average accuracy in long-term forecasting and he is extremely liberal. The notion that only an ultra conservative flat earther would dare deny the imminent catastrophe of CO2 induced climate change is shattered by Corbyn’s claims that the theory is purely political and ignores scientific evidence. While Corbyn uses real science to accurately predict future weather the proponents of Anthropogenic Climate Change have resorted to attempting to link any and all past weather events to man-made causes to further advance their ride on the gravy train.